A draft plan for a possible second runway at Gatwick Airport has been published by airport operator BAA. 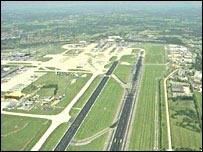 The new runway would only go ahead at the West Sussex airport if a planned extra third runway at Heathrow failed to be developed by about 2015. It would be south of the present runway and would not be built before 2019. 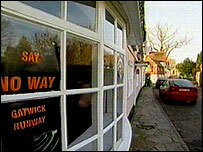 Gatwick was left out of expansion plans originally published in December 2003 but opponents to expansion elsewhere forced the government to consider it. When the government's white paper came out in 2003 its proposals for the South East were extra runways at Heathrow and Stansted. It confirmed the government would honour a legal agreement with the local council which ruled out the building of a second runway at Gatwick before 2019. West Sussex County Council called for the prospect of a second runway at Gatwick to be completely dropped, but people opposed to expansion at Stansted and Heathrow argued it was wrong for Gatwick not to be considered on the basis of an old agreement. The High Court ruled in a judicial review the government white paper only considering Stansted and Heathrow had been illegal. The draft plan published on Tuesday features a second runway 1,130 yards south of the existing one and adds that a third passenger terminal "could and should be located between the runways". The plan talks of taking slightly less land to the north of the current airport boundary than had previously been mentioned. This would reduce the impact of any new runway on the nearby village of Charlwood where opposition to expansion has been particularly vocal. Gatwick managing director Paul Griffiths said the airport would seek "responsible growth" and any future development would be "sensitive to the local community". BAA said work planned for the airport in the next few years would include changes to ensure it could take the new Airbus A380 "superjumbo" and to increase the number of passengers which can be taken through the two existing terminals. Peter Barclay of the Gatwick Area Conservation Group said a second runway would mean significant extra noise for 20,000 people. He said: "The new runway is to be built if Heathrow does not meet pollution levels, why should pollution be acceptable at Gatwick if not at Heathrow?"